This is one of my more unusual process posts as I am redoing a piece instead of starting on something new. I loved the concept but wasn’t pleased with the first execution. The desire to achieve this idea's full potential, however, did not lessen over time, hence the second attempt. I was glad that I decided to do it! The results are everything I wanted and I’m excited to share the results with you. How does one redo a piece? Well you see, I backpedaled to the detailed sketch stage, retracing and transferring the piece onto a sheet of Strathmore Smooth Bristol paper (11x14 in.). Even though the oil painting succeeded in capturing the mood, I had difficulty preserving the freshness of the sketch. The oil paint presented challenges I did not expect, splitting my focus considerably. The idea for this illustration came from an ArtOrder challenge. The mysteries of the ocean and blue color scheme interested me. Since I hadn’t created an underwater piece before, I thought I would do well to try. Several thumbnails later, I began to feel a certain backstory take shape in the first image. The first thumbnail resonated with me, birthing a backstory. How are mermaids typically represented? In what way can I challenge the norm? Mermaids often carry this stigma of death wrapped in mysterious beauty. The unfortunate victim usually ends up lured and drowned under the influence of the mermaid’s enchantments. 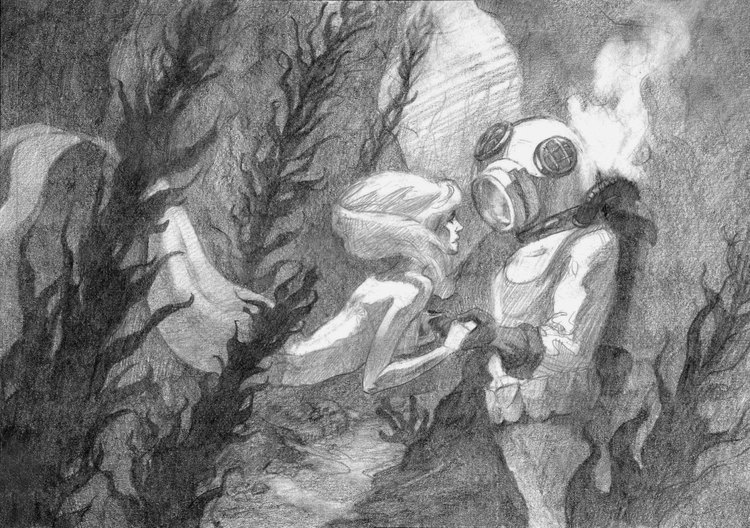 For this illustration, however, I decided to go back to the tragic innocence of The Little Mermaid, turning the visual into a Romeo-and-Juliet narrative. The mermaid and diver have feelings for each other, yet they are separated by their ways of life. This visual gives the viewer a glimpse into a quiet, vulnerable moment that exudes a bittersweet hope. Sad things are deep and often go unexpressed. I wanted to illustrate that reality and shed light on a fundamental need we all share: to connect with and be understood by those we love. Finished graphite drawing. Colored in Photoshop. After redoing this piece, I felt that I successfully unearthed what was buried in the first painting. It's a great feeling. You may have an idea you tried to visualize in the past. Perhaps it didn't meet your expectations, but you've learned and improved since then. I encourage you to dust off that work, remember what it was you loved about it, and try again. You can do it. I believe in you. You care about telling stories through art, otherwise you wouldn't have read to the end of this post. I care about your success and want to help you navigate the creative process. The articles posted each week are meant to encourage, advise, and inspire you on your way, but if there is no input, I’m simply guessing at your needs. I have two questions for you. Your answers will help me serve your most important needs. 1. When it comes to creating art (specifically illustration), what are you struggling with? 2. If you could master an aspect of illustration today, what would it be? Thanks for helping make this blog the best it can be.